It’s been a long time since I pieced anything with these many points to be matched! I ended up pinning every match so it took a while. For the most part, they’re right on, but there’s a couple of places …well, we won’t talk about those. Next step is a wider border that has prairie points. I have the prairie points sewed, now to turn them and press. I’ll do that bit by bit over the next few days. 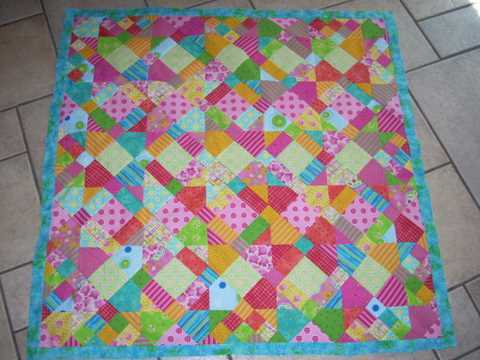 I’m feeling in the mood to get another smaller quilt on the frame and get it quilted, so it might take a few days to get to those points. I also have a quilt from the guild quilt bank to quilt. I need to get that done by the next meeting at the end of the month. I signed up for the free package from Site Meter and it’s neat to see where my visitors are from. Welcome to all from Connecticut, Texas, Tennesse, Colorado, California, Washington, Germany, Switzerland, Isreal, and Austrailia! It’s a small world!